I had the absolute pleasure of creating some dreamy summer bouquets and compote bowl designs for the Orchard Farm wedding of Laura and Dan. Now I had never been to Orchard Farm in Holmes Chapel, Cheshire before, but that was kinda the point! Groom Dan is an absolutely awesome wedding photographer and when he popped the question to the gorgeous Laura, he knew he didn’t want to marry his love where he’d shot a wedding before. 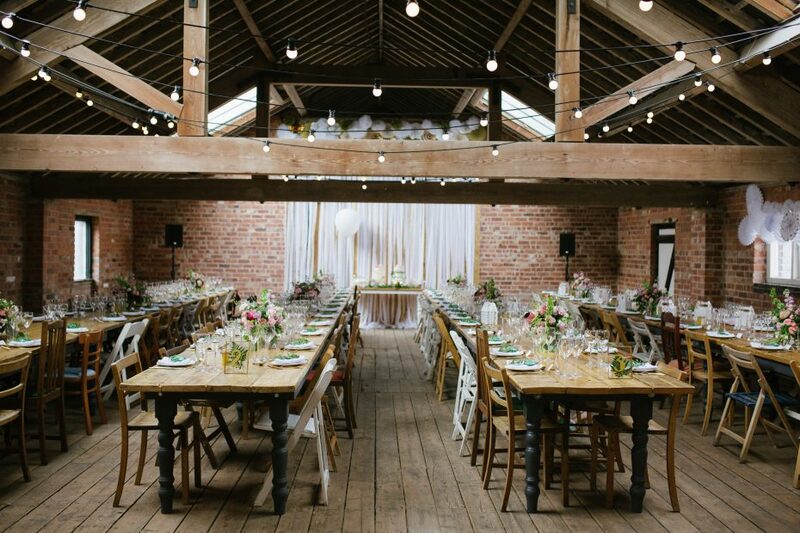 The also knew they needed a place to party the night away, and set about a search for a barn where they wouldn’t be bothering anyone with all the fun, music and dancing! 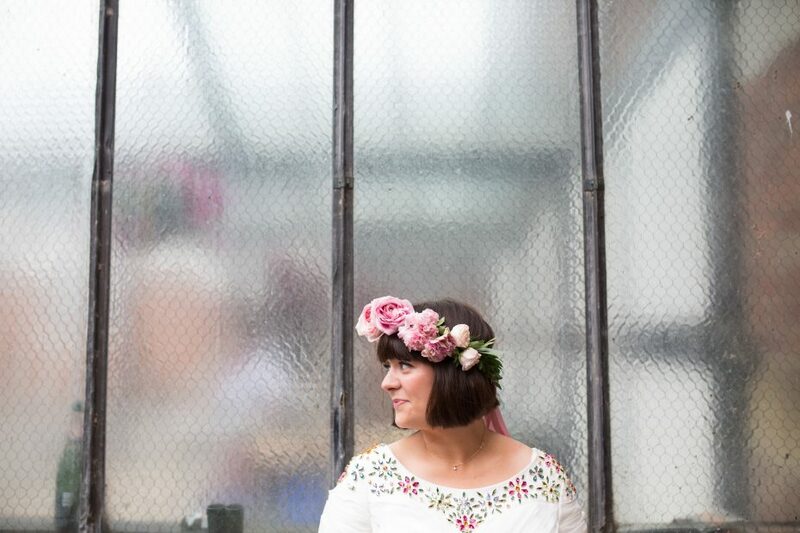 When I first met Laura and her mum for coffee, I knew I wanted to be their florist within about three seconds of chatting! Laura described a full, lush and bountiful bouquet that I just HAD to make. And teamed with the fact she was keen for her maids to carry armfuls of loveliness too I was there, heart and soul. I was even more thrilled when Laura said they’d booked Emma Case as their photographer, I knew we’d have some seriously beautiful shots as I’d had the pleasure to work with Emma before as you may have seen here. 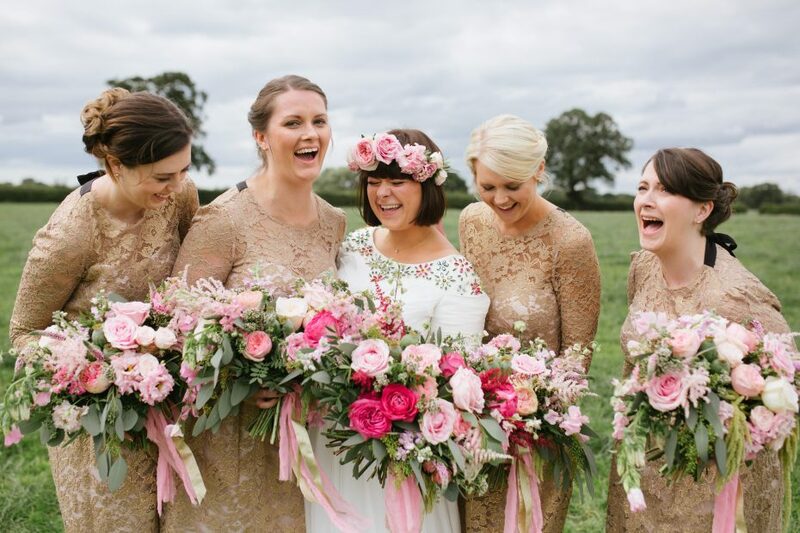 The flower selection for Laura and her girls bouquets was just heavenly. 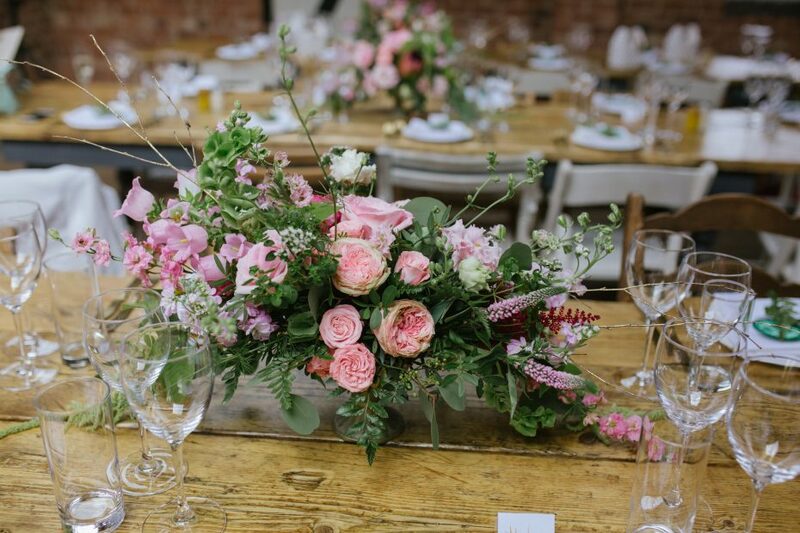 They all carried bouquets that featured a glorious selection of David Austin garden roses, scented O’hara’s and textures and foliages, as well feathery astilbe and a summer favourite – sweet peas. 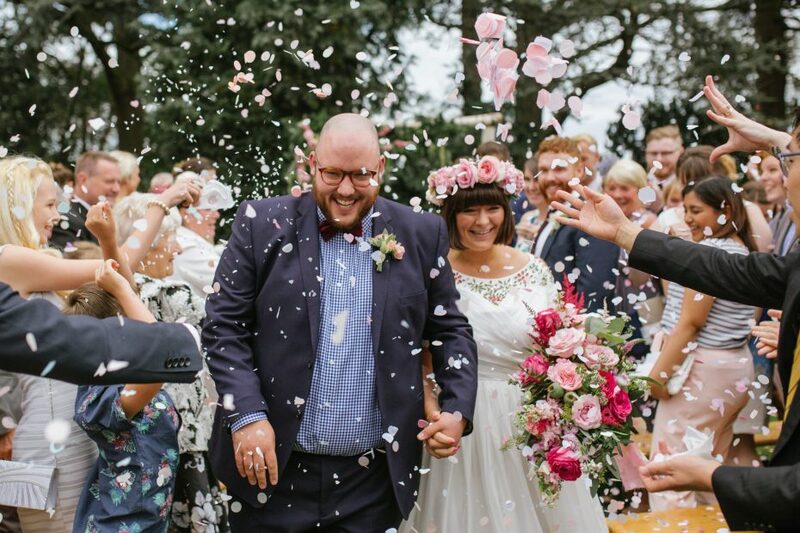 We did however make sure that Laura’s bouquet had that extra POP of colour so her blooms really stood out from the rest! 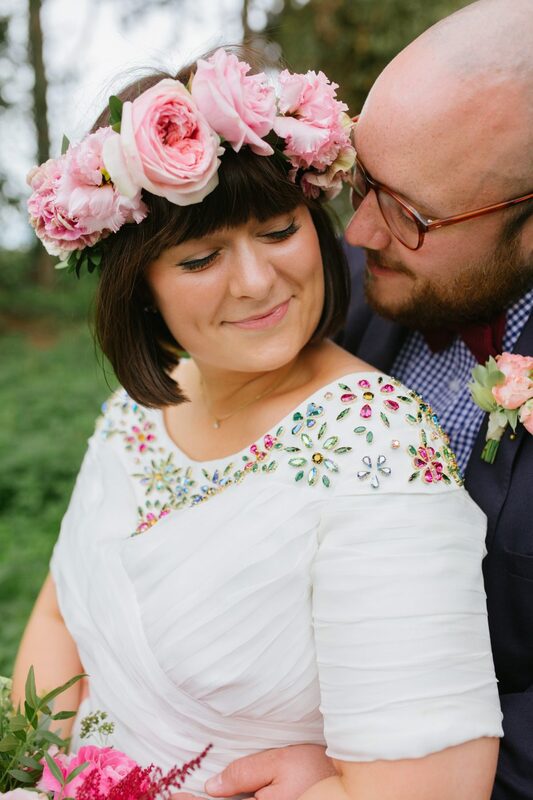 Laura also wanted a fully blooming flower crown – full at the front and tapering to the back – no problems there! 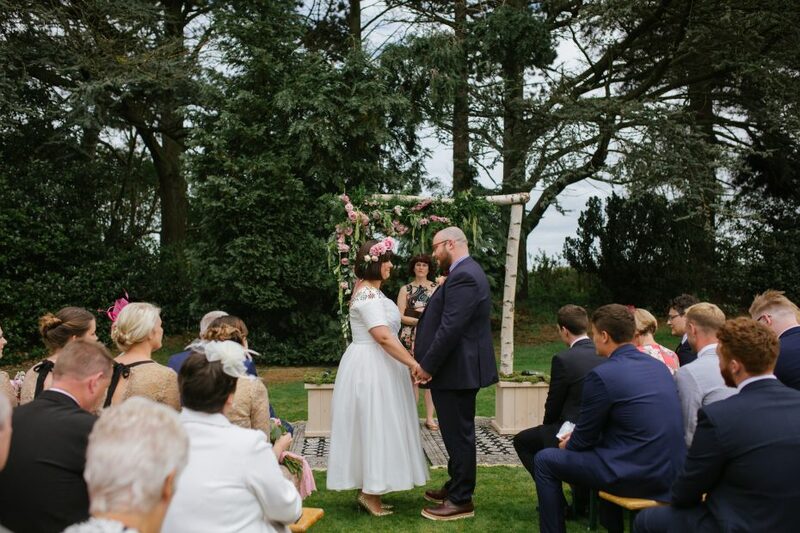 After the rather emotional ceremony under our beautiful bespoke arch way, the couple hosted their friends in the upper part of the farms’ barn. 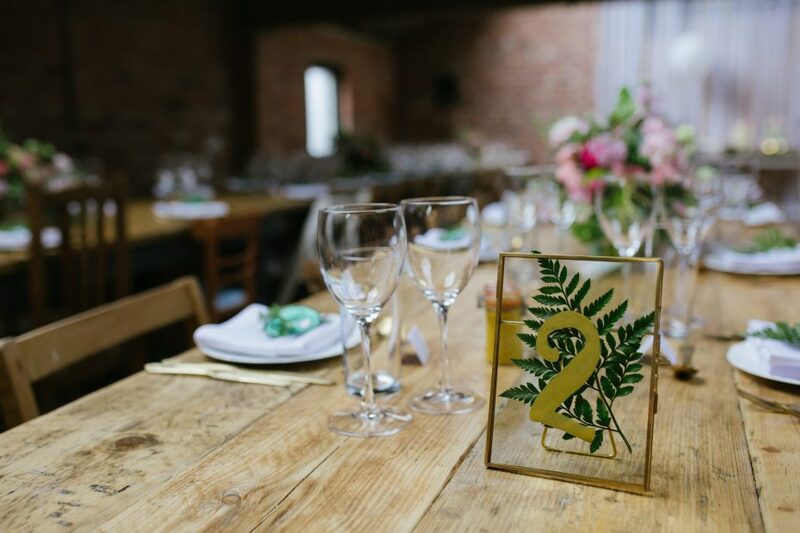 The scrubbed tables and exposed brick walls really didn’t need much enhancing, but we added some of my favourite compote designs along the tables, and added a little foliage accent on each napkin and inside the table number frames. CUUUTTTE. 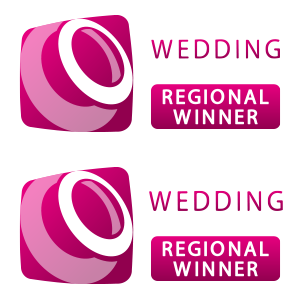 It really was our pleasure to create for Laura and Dan. they had great taste, great personalities and I was thrilled to hear, a great time on their special day. Thanks for letting us be there with you!